"GLONASS-TV" is a Vendor of GL-TV34. GL-TV34 Fuel Level Sensor has remarkable characteristics with connection type and data transmission parameters completely similar to Omnicomm fuel level sensors. Thus, GL-TV34 can replace them without tracker reconfiguring. Sensor configuration is performed with UNU Omnicomm configurator or Gurtam devices that do not require external power supply. The sensor prototypes have been tested for more than three years under different conditions. All the detected errors and weaknesses were worked out and resolved in the initial testing. Over the last year sensor software has constantly been updated. 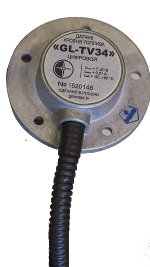 This allowed to ensure its full compatibility with Omnicomm digital sensors and to improve the sensor output accuracy. GL-TV34 sensors are fully compatible with all types of tracking equipment with digital interface. The warranty period is 5 years. The vendor is planning to extend it to 10 years, as high- quality elemental base is applied during manufacturing process. The sensor reliability itself is usually higher than the reliability of loop connectors, which can grind, or otherwise wear down due to improper or heavy use.